Lymphoid follicle. Coloured light micrograph (LM) of a section through a follicle of a human lymph node. 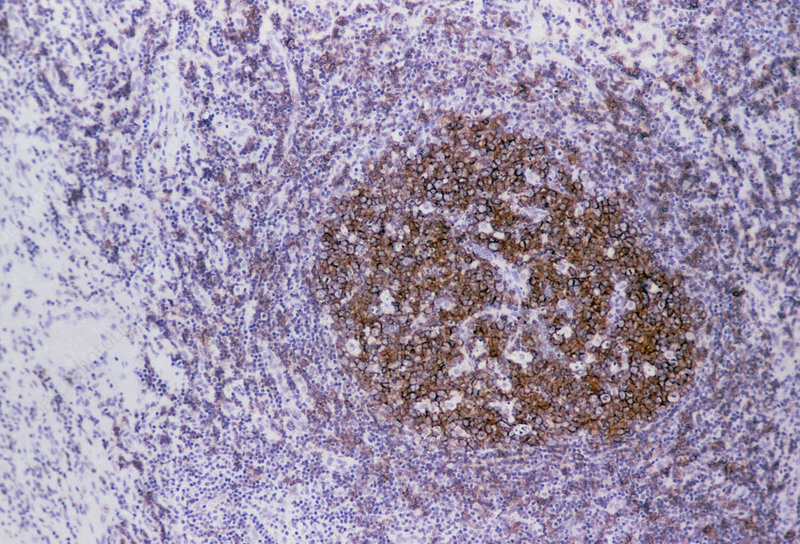 The follicle contains B-cells and antibodies, parts of the immune system, within its germinal centre (brown). B-cells, or B- lymphocytes, are white blood cells which produce antibodies against foreign microorganisms. The follicle is surrounded by cortical tissue (at far left). Lymph nodes filter harmful organisms from the tissue fluid that drains into them through the lymphatic vessels. CD20 stained cells. Magnification: x100 at 35mm size.